...As I Remember It...: He Is Not The Sun, You Are! One of the yummy books I devoured this year is Year of Yes: How to Dance It Out, Stand In the Sun and Be Your Own Person by Shonda Rhimes... writer of the hit TV shows Greys Anatomy and Scandal. This is not a book review but I do have to give a shameless plug for The Year of Yes because it reminded me of one of the best episodes of Grey's Anatomy. 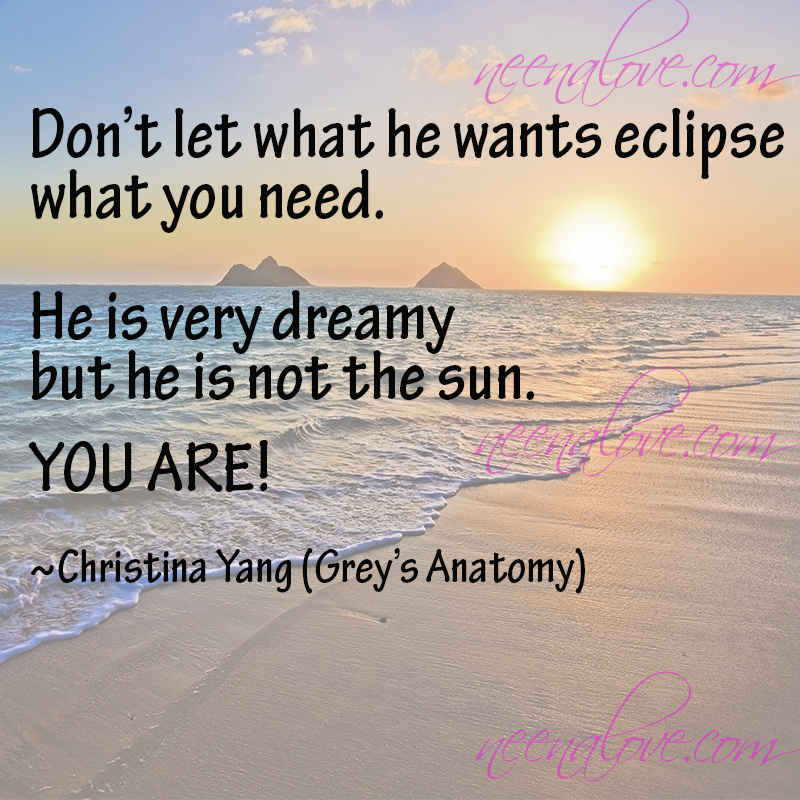 This post is not just for Grey's fans because I am not a die hard fan. I have not finished the series and I don't know if I ever will. Who has the time to sit through more and more of Meredith and McDreamy? I could watch Chandra Bailey do her thing as Dr. Bailey. Her character was so well written and was the one that most resonated with me. Anyway, Meredith Gray is the main character of the show. She has a hot steamy romance with Dr. Shepard, played by Patrick Dempsey. Meredith Gray's best friend is Christina Yang played by Sandra Oh. Christina Yang is one of those girls whose mind is complete and straight logic. Anything moving away from that is utterly out of her comfort zone. She is the analytical voice always in Meredith's ear prodding her out of her emotional cravings to be needed by Dr. Shepard. In this classic Grey's episode, Christina is leaving for her dream job in Europe. They are writing her character off the show. Christina and Meredith go through this whole series of goodbyes with Christina mostly wanting to stay, to halt the inevitable GOODBYE. In typical Christina fashion, she gives the most endearing advice that gives Meredith the boost she needs to make hard decisions. 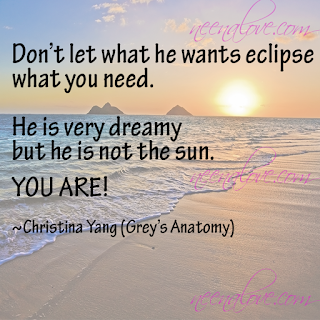 Christina calmly quips, "Don't let what he wants eclipse what you need. He is very dreamy but he is not the sun. YOU ARE!" Every woman needs just the right words to put everything into perspective. This episode, every time I hear those words, "HE IS NOT THE SUN... YOU ARE," reminds me that my desires and ambitions are important. I remember to put me first before everyone else so that my sanity and my peace of mind are intact. How can I be of value to anyone if I am not charged up? I am the SUN! The world does revolve around me. I am a powerful woman who is worthy of all the good things in life.